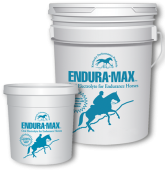 Endura-Max electrolyte powder's unique formula meets the specific needs of the endurance horse. It provides the proper ratio of electrolytes necessary to support optimal performance and quick recovery during and after endurance training and competition. 5# Tubs in stock. 40# special order only.